Though Apple claims that 2014 was "a year of progress," reports from labor rights groups and researchers reveal troubling labor and environmental violations continue unabated. For Apple, this is a great start to 2015, just as 2014 was a fantastic year for the company. Last year, they sold more than 169 million iPhones,  which earned them nearly $102 billion in sales. With $183 billion in total 2014 revenue, and $39.5 billion in profit,  Apple is the most valuable company in the world. These findings are contrary to claims made by Apple in its latest Supplier Responsibility Progress Report, released February 11, 2015. On its website, Apple refers to 2014 as "a year of progress," explaining in the report that it conducted 633 audits of 459 suppliers, at which it found 700 violations of the company's supplier code of conduct. In response, Apple claims to have put corrective action plans in place for all violations, and reports that compliance of suppliers improves with every audit. Yet, Apple provides no evidence of which suppliers were audited, what violations were found where, what specifically the company did about them and whether the problems were actually corrected. Conversely, reports from CLW, SACOM and Chan and her colleagues provide clear evidence of a lack of corrective action from 2013 to 2014 on both the part of Apple and several of its suppliers, including Pegatron, Jabil, Catcher Electronics and Foxconn. Through undercover investigation on Apple product lines, SACOM and CLW found that violations of Chinese labor law and Apple's supplier code of conduct are commonplace. These include work hours in excess of daily and weekly limits, managerially and economically forced overtime, workplace safety hazards including locked fire exits and blocked pathways, underpayment or lack of payment of social and medical insurance for dispatch and student workers, lack of special labor protections for student workers, regular intimidation and verbal abuse, inability to take sick leave or resign with pay, and no opportunity for collective bargaining and meaningful address of worker concerns. SACOM documented these problems at three Pegatron facilities - Maintek Computer, Cotek Electronics and Casetek Computer - all in Suzhou, China. At these sites, workers logged as much as 15 hours per day, and worked for 10 weeks without a day of rest in advance of the launch of the iPhone 6 in September 2014. These workers were responsible for 25 million units of the new device - half of Apple's 2014 inventory (Foxconn produced the rest). These conditions resulted in workers suffering crippling fatigue and numbness in limbs, fainting from the extreme heat on production lines and passing out from exhaustion during their very brief meal breaks. Many of the same problems were documented by CLW at Catcher Electronics during a 2014 undercover investigation of a production line for iPad parts. Just as at Pegatron, the many violations of Chinese labor law and Apple's code of conduct documented by CLW had been previously reported to Apple in 2013. Yet, 16 months later, none of the reported problems had been addressed, and in fact, many more had arisen. Unregulated exposure to the chemicals used in producing iPad parts at this facility can cause serious health problems. According to the US Department of Labor'sOccupational Safety and Health Administration (OSHA) guidelines on metalworking fluids, "Skin and airborne exposures to [metalworking fluids] have been implicated in health problems including irritation of the skin, lungs, eyes, nose and throat. Conditions such as dermatitis, acne, asthma, hypersensitivity pneumonitis, irritation of the upper respiratory tract, and a variety of cancers have been associated with exposure to [metalworking fluids]." In addition, those exposed to aluminum dust areat risk of developing problems with their lungs and nervous system. CLW reported the same pattern of unaddressed and new problems during 2014 at the US-owned Jabil Circuit factory in Wuxi, China, which produces covers for the iPhone 6. Though employees work as much as 11 hours per day for six or even seven days a week during peak production periods, and accrue as much as 158 overtime hours per month (four times the legal limit), they still do not earn the average local wage in Wuxi. Just as for workers at Pegatron facilities, the low wages they are paid make the excessive overtime a forced condition, as they have no choice but to accept it in order to survive. Apple did not respond to questions about what, if any, corrective actions it and its suppliers may have taken in response to CLW and SACOM reports of labor violations at Pegatron facilities, Catcher Electronics and Jabil Wuxi during 2013 and 2014. Meanwhile, at Foxconn facilities, which received quite a bit of media attention following 18 worker suicides in 2010, research conducted by Chan and her colleaguesfound that the modest gain of slightly raised wages is routinely outweighed by increased production quotas on Apple product lines. They also found that though Foxconn promised to let workers unionize, the unions the company sanctioned are actually designed to increase surveillance of workers, with management-appointed leaders reporting worker dissent back up the chain of command. In February 2014, Jacky Haynes, senior director of Apple's supplier responsibility program, said, "We have recently reviewed and strengthened our standards regarding freedom of association." Yet, as of the publication of this article a year later, union reforms through democratic elections have not happened. This and other problems continue at Foxconn facilities, despite Apple's partnership with the Fair Labor Association (FLA), an industry-created body that Apple paid "well into six figures" for their auditing services during 2012 and 2013. The FLA audited Foxconn facilities on Apple's behalf and released a series of reports during that time, with a final report in December 2013indicating that Apple and Foxconn had effectively addressed nearly all labor issues found across three facilities in Guanlan, Longhua and Chengdu. However, Chan and her colleagues found that the FLA's report on the employment of student interns at Foxconn Chengdu contradicted their own investigation. FLA reported that there were no student interns at Chengdu at the same time that Chan and her colleagues documented 7,000 of them from September 2011 to January 2012 - approximately 10 percent of the labor force - by interviewing the students and their teachers. Despite Apple's stipulation that student interns should always be engaged in work that furthers their studies and career goals, Chan and her colleagues, and CLW and SACOM, found that Apple suppliers regularly rely on the forced participation of students who gain no experience relevant to their fields of study on production lines. They simply serve as cheaper, more controllable versions of their slightly older, non-student counterparts. Further, in February 2015, Beijing-based All-China Federation of Trade Unions legal department head Guo Jun criticized Foxconn for imposing illegal overtime of "more than ten hours every day" on workers. In fact, forced overtime was imposed on Foxconn assembly workers during the peak Apple season (September to December 2014) to the extent of 152 hours of overtime a month, far exceeding the statutory limit in Chinese law of 36 hours. Though Apple displaces responsibility for these conditions onto its suppliers, Chan and her colleagues have soundly documented across a dozen Foxconn sites in China that it is precisely Apple's pricing structure, intensely demanding production schedule and practice of pitting suppliers like Pegatron and Foxconn against each other that produces the conditions described here. This finding flies in the face of Apple's oft-repeated claims, in its supplier responsibility reports and in the press, that it takes the harder path of working with suppliers to improve conditions for workers, and that it hands down sanctions to suppliers who are found to be in serious violation of its code of conduct. Essentially doing the opposite of what it claims to do, Apple punished Foxconn for its modest improvement to wages by taking a significant portion of iPhone production away from the company, and rewarded Pegatron for routinely breaking numerous Chinese labor laws with those very contracts over two years' time. 2014 also saw continued problems in the mining operations that feed into Apple products. Apple celebrates its involvement in the Conflict-Free Sourcing Initiative (CFSI), run by the Electronic Industry Citizenship Coalition (EICC), but the EICC is an industry-operated body of only corporate members biased toward its clients. "The EICC's reputation is not great," Julian Kirby of London-based Friends of the Earth told Truthout. Describing EICC events he has attended, Kirby said, "[They're] characterized by defensiveness, a sense of how to manage the problems, and how do you manage the appearance - the PR of the problems, rather than how do we make stuff better." Kirby explained that EICC members will tout things like building schools and hospitals in producer communities, "rather than looking at transparency problems and people dying in mines and suppliers," and working toward "systemic changes." He concluded, "The tech sector and the EICC, the culture there is years behind other sectors. They've got a long way to go." Kirby is also critical of the limited focus of the EICC's CFSI, which, he points out, is limited to conflict in the sense of war. As such, the CFSI overlooks devastating forms of conflict including ecological destruction, destruction of fishing and agriculture industries, pollution of water, injury and death in mines, and forced evictions. A research team lead by Kirby documented all of this in Bangka, Indonesia, in 2012. The report called on Apple to admit that its suppliers source tin from this devastated island, and that it is culpable in the atrocities documented there. After much pressure from Friends of the Earth, Apple did admit this a year later, and spearheaded the Tin Working Group to assess and address the problems found by Friends of the Earth. Kirby gives Apple credit for creating this group, but points out that, nearly three years later, nothing has changed for the residents of Bangka, who live on what he describes as a depleted "moonscape" surrounded by a dead coral reef, and where on average one miner dies per week in an accident. Rather than scaling back their destruction of this island community, Kirby reports that the large mining operators are now ramping up their offshore efforts, which will only further pollute the once pristine water and continue to destroy fisheries. All of this evidence suggests that Apple's internally managed model of corporate social responsibility does not work. The company's slick publications, and claims in the press and on its website contribute to the value and power of its $118 billion brand, but do not foster systemic change in its troubled supply chain. That change will only come with real transparency in terms of how the company's products are made, how specifically Apple works with suppliers to fix problems and the results of those efforts. 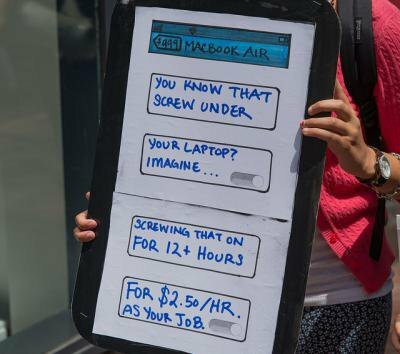 Further, SACOM and CLW urge Apple to make good on its promise to support worker unionization by providing labor rights training via independent labor rights groups, which could ensure effective workplace monitoring. At the least, companies such as Apple and Foxconn - the world's largest electronics manufacturer - should observe national labor laws and regulations. Copyright, Truthout.org. Reprinted with permission. Originally published 19 Feb 2015.